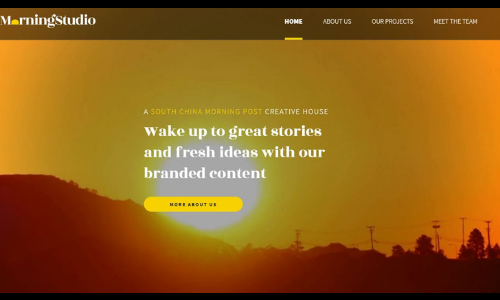 South China Morning Post has launched Morning Studio today, a dedicated branded content team to connect advertisers with readers through enhanced content solutions offerings. The newspaper said Morning Studio “is the capstone of this grand platform that connects readers and advertisers around the globe who want to be a part of the conversation about China that the SCMP is leading”. Named for the optimism and fresh ideas that each day offers, Morning Studio is positioned as the creative arm of the SCMP. “Morning Studio helps advertisers to not only reach, but also to engage these unique Asia-curious audiences,” said Romanus Ng, SCMP’s general manager of advertising & marketing solutions. Morning Studio is the latest addition to SCMP’s digital products. Earlier this year, SCMP launched new digital products including Inkstone (daily-digest China stories), Abacus (China Tech) and Goldthread (food and culture). “Content builds relationships – Morning Studio helps brands build a content strategy on our platforms that will form a stronger bonds with their target customers,” said Karrie Lam, head of sales and marketing solutions at SCMP and curator of Morning Studio. In 2009, SCMP set up the marketing solutions team, and now Morning Studio has incorporated this award-winning group to pioneer the next frontier. Morning Studio brings together world class branding strategists, multimedia designers, audio/video producers, and editorial experts who have a deep understanding of SCMP’s readers. Its online content can be further enhanced by offline offerings such as sponsored supplements, bespoke publications and customised events. Jill Chang is named as managing director of Wunderman Taiwan and Eliza Tsai is promoted to deputy general manager. ..